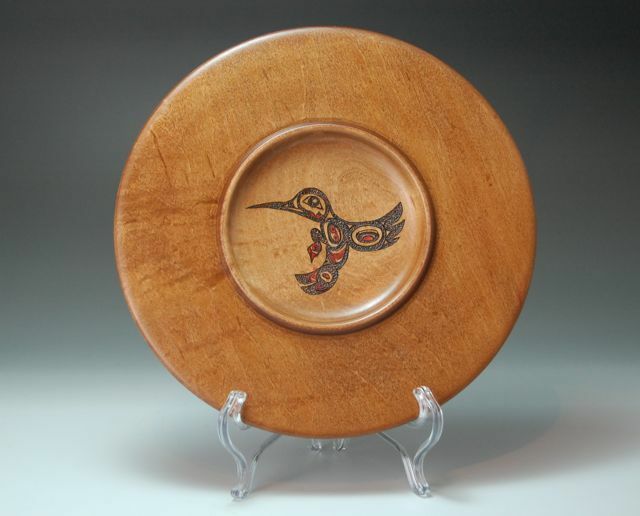 Here is another piece of Yellow Cedar “Darn Raven”. The Raven is stealing the sun, again? I have included Cat Tails and Geese. I now will refer to the influence as from the art of the indigenous people of the Pacific North West. This piece is also influenced by Douglas Fisher who turns ‘world quality’ pieces using similar techniques. Most of his pieces include an off centre and off access turning, both of which I included in this piece. Having said that his work is in another class all together! 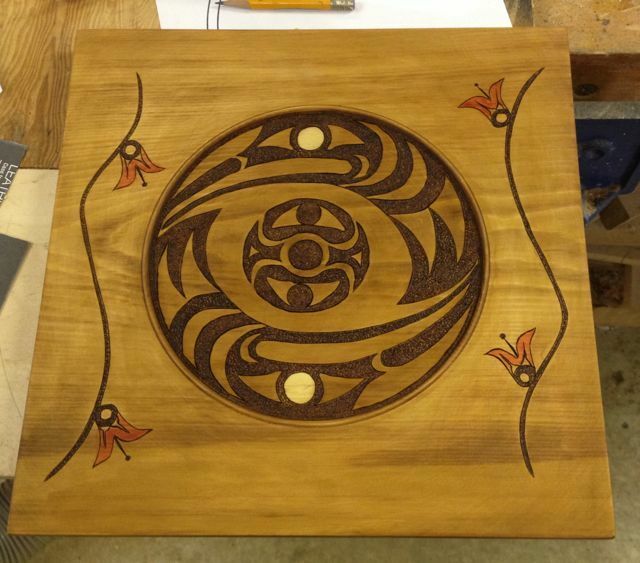 I have used pyrography and wood dye to add the details. 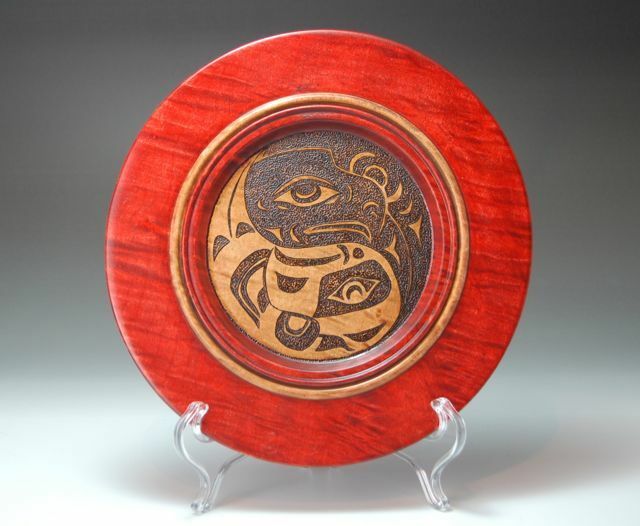 This piece is about 11 3/4 ” diameter and 3/4″ thick. It was finished with several coats of rattle can lacquer. I find Yellow cedar quite difficult to work with, it is somewhat soft and as such is susceptible to scratches and nicks while it is being detailed. All work as far as the tuning goes was with the usual wood turning tools but I plan to try to do some detailing with a router to see how that will work. I continue to turn lots of things on my lathe and like to share them here. 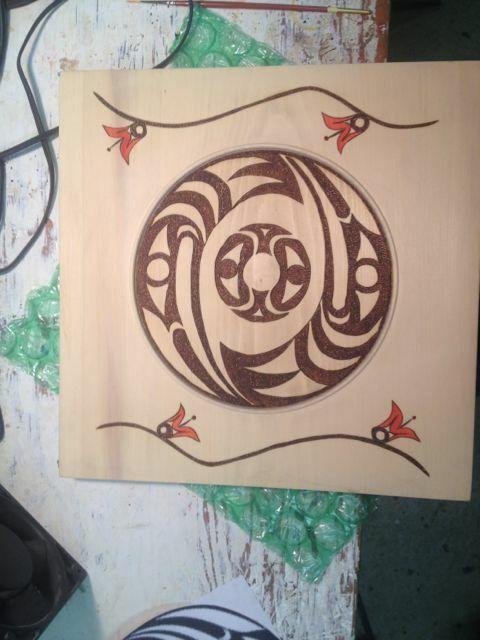 Lately I have been experimenting with Haida Motifs and am really pleased with the way they have been turning out. 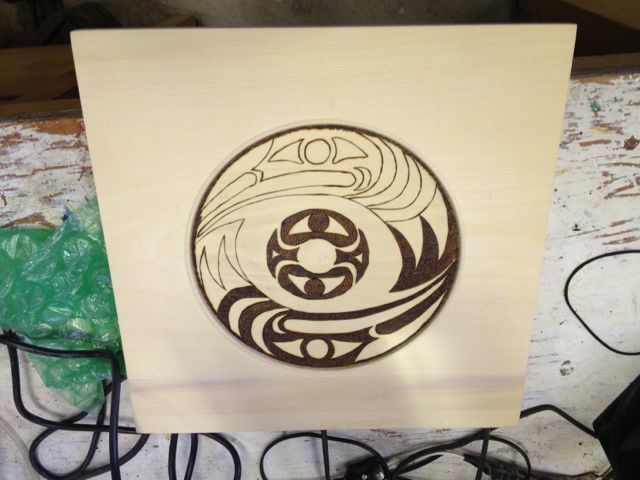 Here’s a few shots of a 12″ square Yellow Cedar Plate/Platter I first turned then burned and finally added some colour. As you can see these are pictures taken in my workshop at various stages. 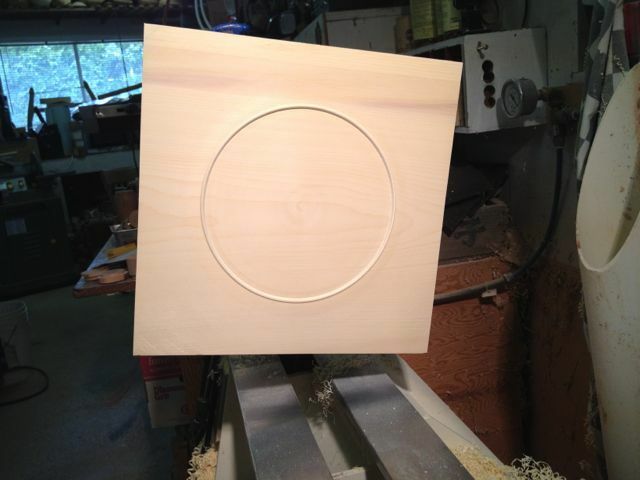 The first is the platter with a turned bead, prepared for embellishment. The second is the beginning of the pyrography. The third is with colour added to the Honeysuckle. The final is the finished product. Many items are available for sale on my web site Woodbowlsandthing.com. 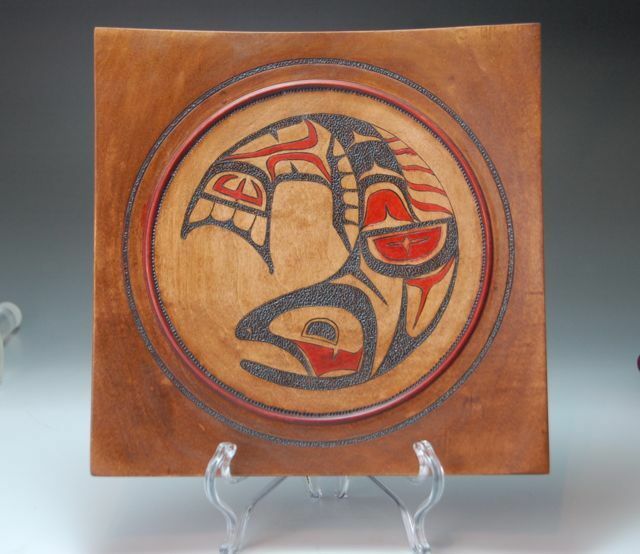 I’ve always admired the skill and color of Haida art. Below you will find a few pieces that I have made in an attempt to honour this art form.